Miso Crafty Knits: Win It :: Valentine's Day Giveaway!! Win It :: Valentine's Day Giveaway!! Who's in the mood for a little impromptu giveaway?? I know I am!! I'm not really a Valentine's Day type of person, but I'm the kind that will hang out in the seasonal area of the store waiting for that moment when all the holiday chocolate goes on sale. Heh heh heh...and yeah, I'm not ashamed to admit that! Anyhoo, both the Mister and I don't celebrate Valentine's Day either as we're already pretty cheesy on a daily basis. We don't expect gifts from each other (yet I would NEVER turn down a gift of yarn...hint, hint Mister!! ), nor do we expect the other to make a fancy meal (unless lobster or the like is on sale, then we just become opportunists. I mean, come on, cheap lobster? Who turns that down?). Valentine's Day is just another day for us. Except that it's unusually full of red and pink colour everywhere. But that's not a bad thing. Well...not to me. But then again, I'm all about the pink! Ok, I'm totally digressing here. So anyways, I know there's a lot of other people who don't celebrate Valentine's Day either. Some people are bitter, some just don't care, some think it's too Hallmark-y, and some just aren't into the PDA thing. Then there are those who absolutely adore Valentine's and they totally go all out. Regardless of what camp you belong in I thought, "who doesn't like a giveaway?". While rooting around the fabric stash the other day I came across some very cute and very topical fabric for the "holiday" and decided to whip up a project bag. As I was sewing up the last seam yesterday afternoon I decided, hey, why not give this bad boy away? So I am. The print might not be your cup of tea but hey, who would turn down a free project bag? And with so many knitters taking up sock knitting, who doesn't need a special bag for their current sock WIP? Even if you're not a knitter, I'm sure there's a knitter in your life who would appreciate a fun project bag. Ok, enough of trying to sell you on the idea of a Valentine themed box bag. Let's get down to the giveaway, shall we? 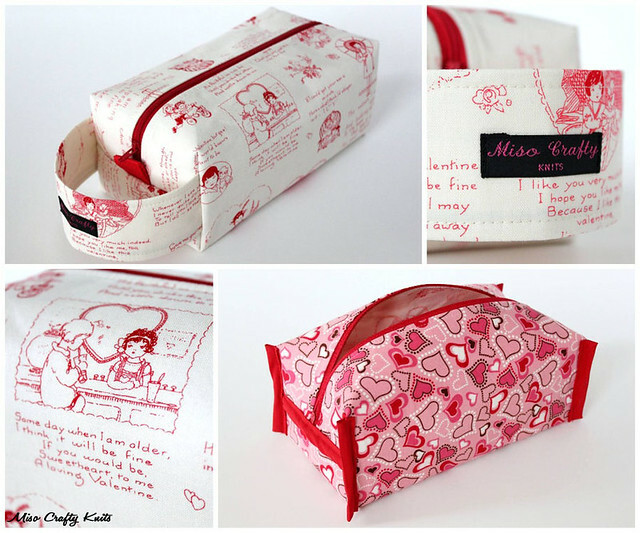 One lucky winner will receive a small zippered box bag in the Retro Valentine print (pictured above). :: Retro-inspired Valentine drawings and sweet expressions printed in red on a creamy background. :: A sweet heart print lining for that little extra flash of love. :: 100% cotton, exclusive of trims. :: Features two (2) red nylon webbing pull-tabs (one at each end of the zipper), matching red zipper and inside finishings. :: Bag dimensions are approx 8" long, 5" wide, and 4" tall. Handle is 8.25" long with a drop of 3". :: Giveaway is open to everyone (yay!!). :: Giveaway is open until Saturday, February 15, 2014 at 12:00 midnight PST. :: All comments must include a valid email address or Ravelry ID so that I can contact you if you are the winner. Comments not containing a form of contact will be disqualified. :: Leave a comment below telling me why you love reading knitting/craft blogs. :: Bonus entry #1 - "Like" Miso Crafty Knits on Facebook and leave a separate comment letting me know that you did. :: Bonus entry #2 - Follow @misocraftyknits on Twitter and leave another separate comment letting me know that you did that too. :: Bonus entry #3 - Follow @misocraftyknits on Instagram and leave another separate comment letting me know that you did that too. If you like this bag and want a guaranteed claim to a retro V-Day themed project bag, there's currently one listed in the shop! Love!! Cute! I probably read too many knitting/craft blogs, but I love the inspiration. There are several that I use to get a good idea of fit and color on projects, because I like to do my research. Oh, and the pretty colors! Love the eye candy! I like to read knitting/craft blogs for inspiration and to learn. Thanks for the chance! I'm shaybear on rav. I love your beautiful photo's of yarn & knitting projects. I also love your project bags! I just found your blog and already love it. I appreciated the needle reviews!! Would love to win the giveaway! AmandaLynA on Ravelry. I love reading crafting blogs, especially knitting blogs. Because I love the pics of yarn. And I love the stories. And they are very inspiring. I love reading knitting blogs for the inspiration. I can see new yarns and patterns I never saw before. I read knitting blogs to get inspired - it's way too easy to get stuck in your comfort zone, and seeing what other knitters are working on (and the tools, techniques and yarns they're using!) really gets me thinking outside the box. Ooh, this is gorgeous! I only recently discovered your blog, but I was so happy to find another great knitting blog, especially from someone who is "local" for me (ie, in BC). I love reading knitting blogs because I get ideas about what to knit and/or what yarns to try out. I also get inspired/motivated to knit myself - and try new patterns that might otherwise have intimidated me. I read knitting blogs because they connect me with my people. My real-life friends don't knit and have no interest in it, so I need internet friends to chat about yarn with! I'm also following you on Facebook, Instagram, and Twitter. It just doesn't seem fair to leave a comment for each one so I'm doing them altogether. Because I love seeing the gorgeous projects and getting ideas, plus then I get to know more about what you're knitting than just seeing it at knit night! I already liked your Facebook and followed you on twitter :) rav is kathrynbella as usual! Because I love all the inspiration, and I love seeing how different colourways look when knit! Love the impromptu V day give away!! And the material, and your products and well you are adorable! I love reading knitting/crafting blogs because I find them so so inspiring. They also tip me off on other good ideas, projects, new to me knitting patterns, etc. Same with instagram, I follow tons of knitters/paper crafters/letterpress printers just because its nice to see a little inspiration through the day. I was the only person at Sooke Knit Night last week without one of your bags. My reusable nylon bag - free with wine purchase! - is looking pretty sad. When are you doing another seconds sale? Following you on Instagram ;). Rav ID is angeleena. I'm a crafty junkie and read to feed my habit. love this little bag! 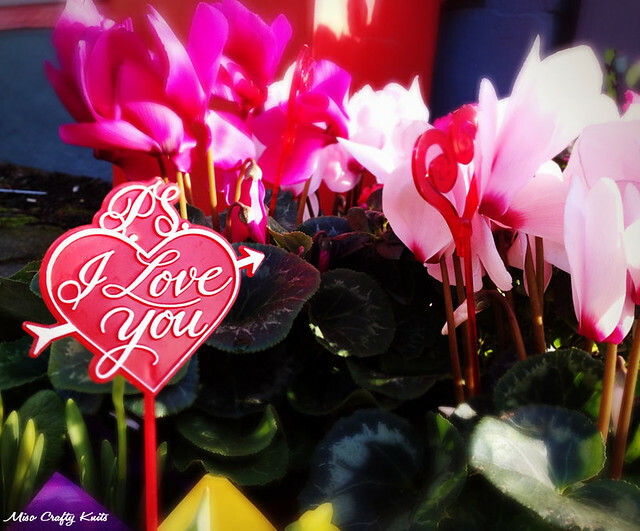 happy love day to you! Yay!! Happy Valentine's Day to you! I enjoy craft / knitting blogs because they help to inspire me to produce better crafty work myself. I'm very prone to accepting work that is "good enough" from myself, but then I see others only accepting the best work from themselves and it makes me pick up my game too. I love to knit and I like seeing what others are thinking when it comes to knitting and what is going on. I love reading knitting blogs because it helps me feel more involved in a broader knitting community. It also provides SO much inspiration! I'm always learning about new yarns, seeing new colour combinations, or new patterns that I'd love to try :) SarahVV on Rav! I also liked you on facebook! I already follow you on twitter, so I don't know if that counts. SarahVV on Rav! I followed you on Instagram! :) SarahVV on Rav! I love to read the knitting blogs, very inspirational and I can relate to just about everyone! Iam following you on Instagram! I'm pretty sure I follow you on twitter. If I don't already I do now. What a sweet little bag! I love me some pink too �� I love getting inspired by all the Knitty and crafty goodness on blogs, sometimes seeing a pattern in a certain yarn on a blog js enough to make me cast on right away! I love Knitting blogs there is so many inspirations such as yarn, project bags, patterns and more that you can gain just by reading. I have been following you on Instagram cause I love the socks! I like the sites bacause Im new to it and trying tok learn everything. I started knitting to make meaningful things for my kids. I love seeing them wear my hand knits. I'm expectingsam on Ravelry. Thank you! I so need a project bag! and, since I've finally joined FB, I've liked you there as well! I love following your blog, I'm a knitter but I've never finished a pair of socks yet. I love the eye candy yarns you always post. I'm jasenhan on Ravelry. I'm following you on Instagram and Facebook. Thank you for the chance to win! Wow, what an awesome giveaway, thank you! I love reading crafting blogs because maybe it makes me feel a little more "normal" in my knitting obsession. Plus it is so inspiring. I love reading crafty blogs for ideas and inspiration. I also love the community of crafters it produces. davidandamandahill(at)gmail(dot)com. I am inspired by craft blogs to explore new ideas; and it's interesting to keep up with old friends. I love reading crafty blogs due to the visual stimulation of course! Having a desk job and reading black and white emails all day long are hard on my eyes (and soul). Stopping by crafting sites to see colorful yarn, fabrics, and materials are so refreshing. It also gives me inspiration for new projects and gives me confidence to try my hand at something new. That's how I got into candle making! I love the creativity, the inspirations, links to other blogs and basically it just makes me feel good! I get so inspired by reading crafting and knitting blogs. I love it! I love reading knitting blogs and others for ideas and I like to see what everyone else is doing out there in blog land. I like reading knitting blogs to see what other people are making and talking about. Seeing how others take a project and make it their own is inspirational, and seeing that others struggle makes me feel like I'm not the only one! I love reading knitting blogs - and yours is one of my favourites!! It's constantly inspiring, always entertaining. I read knitting blogs for inspiration. I love looking at pretty things. I love all knitting and crafty blogs for inspiration and ideas! Gorgeous work! I love blogs like Yarn Harlot because I love the stories behind projects - and she always has the best stories!